Senator Jeff Sessions speaking at the Values Voter Summit in Washington, DC. 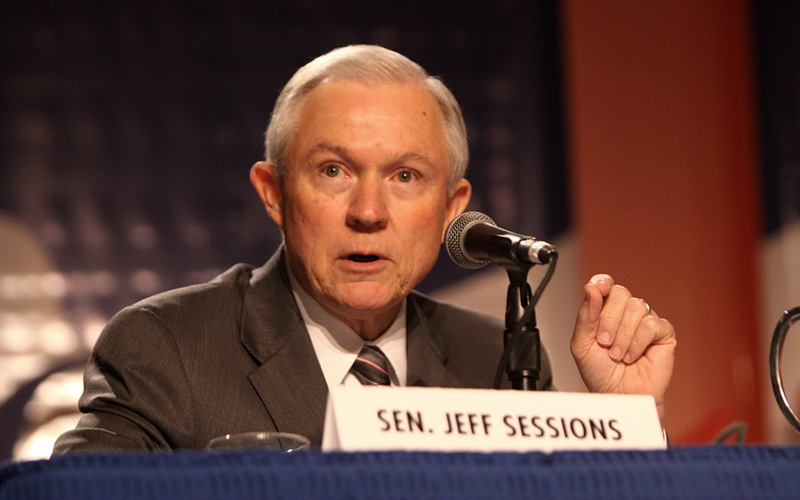 Senator Jeff Sessions (R-AL), a longtime student and teacher of both Bible and Constitution, will meet this week in confirmation hearings with the Senate Judiciary Committee, seeking approval as U.S. Attorney General. Like most Americans, including his fellow evangelicals, Sessions knows that lawlessness, open borders, crime and drugs destroy lives and weaken our nation. George Soros will be at the hearings too. Not in person, of course, but in the form of evangelical and Catholic “mascots” who accept his funding and share in his agenda. Soros, an atheist billionaire, has also funded Ready for Hillary PAC, as well as activists for open borders, amnesty, Islamic “refugee” migrations to the West and many other culture-wrecking efforts in Europe and America. Soros-funded leftists are busy teaching a new generation to use selective Bible quotes and buzzwords to push a post-American, globalist agenda. The Soros network’s New America Foundation aptly refers to its sponsorship of religious mascots as “Rent-An-Evangelical.” Soros began funding Rev. Jim Wallis’s leftist journal Sojourners over a decade ago, to teach Biblical catchphrases and “the faith narrative” to previously secular Democrats, in the hope of peeling off Christian values voters. In 2010, Wallis famously denied being on Soros’s payroll — until he was caught with the money. Richard Cizik, former policy head of the National Association of Evangelicals (NAE), admitted it. Wallis and Cizik are busy teaching a new generation to use selective Bible quotes and buzzwords to push a post-American, globalist agenda. Socialists have long beguiled Christian citizens with “faith” optics and words ornamenting their projects. Their technique, tempting not only to liberals, is to cherry-pick Bible verses while ignoring the whole counsel of Scripture. The Soros-Left then organizes its network to swarm an event or person, like Senator Sessions. Their large, subsidized media then dutifully parrots their divisive message. Think: Saul Alinsky for the Digital Age. Sojourners, Wallis’s journal. Its recent diatribes include: “Resistance is Patriotic — and Christian,” “NAACP President and Colleagues Stage Sit-In at Sen. Jeff Sessions Office, and this pro-Islamist critique of Christians in government. Faith in Public Life (FPL), a putatively Catholic organization which, as Wikileaks revealed, was paid by Soros to try to influence Pope Francis’ visit to the U.S., and spin it as a win for pro-choice Democrats. FPL’s leader, John Gehring, has chimed in against Sessions here and here. See Rev. Robert Sirico’s worthy critique of “Soros’s Catholic Useful Idiots” here. People Improving Communities through Organizing (PICO), which also took Soros money to spin Pope Francis’ visit. PICO’s contribution to the Sessions debate was published here. Members of the Evangelical Immigration Table (EIT), a public relations campaign, launched by the secular National Immigration Forum (NIF) of Soros, Ford, Carnegie and other foundations. Thankfully Americans are waking up to the Progressive machine, fueled by Soros and friends. In 2016, thousands of Christians signed a “Call to Repentance and Renewal” to ministers advancing progressive chaos in our cities and nation. A short “must see” video followed, which documents Soros’s Formula. Immigration laws are a necessary part of a just society. As we read the whole Bible, we’re taught to love ourselves, our families, our neighbors, our cities, as well as the stranger (ger in Hebrew) who comes lawfully as a blessing. What we see in the Bible is not open borders, but wise welcome. Let us welcome Senator Sessions to the Trump administration.